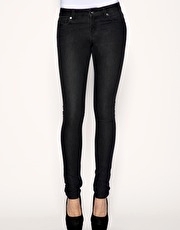 Produktbeskrivning för ASOS Black Washed Skinny: Skinny jeans. Featuring a washed finish, five pocket styling with stud detailing and a slim fit. Model wears a UK 8 and her height is 176cm/5'9.5"